In 1964 I went to the newly opened National Theatre at the Old Vic to see a performance of an Ibsen play, The Master Builder. It was only when I bought a programme that I realised that I’d got the date wrong and had tickets for a preview of a new play called The Royal Hunt of the Sun by Peter Shaffer. It was about the conquest of the Incas, and it was stunning. Magnificent. And profoundly moving. Until that point I had not heard of Atahualpa and Pizarro and had only a hazy idea of where Peru was but the play set in motion a chain of events that resulted in the founding of Bradt Travel Guides. I was determined to go to Peru and see the remnants of the Inca Empire for myself. I got a job in Boston to earn enough money (occupational therapists with English accents were in demand and decidedly better paid than in the UK), and made my first visit to Peru in 1969. I slept in the ruins of Machu Picchu, walked around the site by the light of the full moon, and the following day climbed up to what is now known as the Gateway of the Sun to stare at an overgrown trail leading into the jungle. Where, I wondered, did it lead? I found out in 1973 when I took my new husband George to Peru. Some fellow backpackers told us about a path to Machu Picchu from the train station at Kilometre 88. It was not easy to follow, since the most worn trails were where people had gone wrong and retraced their steps, and some stretches were ankle deep in bog. But we made it to the Gateway of the Sun and marvelled, as thousands have since, at the sight of Machu Picchu stretched out in front of us. I turned round and recognised that jungly trail that I had noted four years earlier. This was our second trek in the Andes. 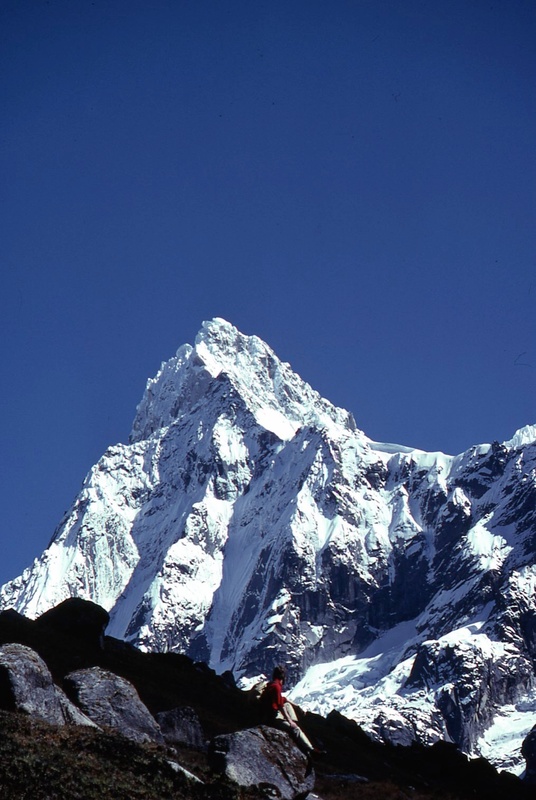 The first was through the Cordillera Blanca, relying on local information to help us find the route over the mountains. There were no guidebooks for backpackers and no locally-available maps. Nor did we have a tent or, in my case, sleeping bag; they had been stolen earlier in the trip. We found shepherds’ huts to sleep in or rigged a shower curtain between trees. I wrapped myself in a poncho until I found a destitute gringo willing to part with his sleeping bag for a few dollars. I had refused to buy hiking boots, thinking that this might act as a deterrent to George’s silly ideas about hiking in South America. It was in Bolivia, on a spectacular pre-Inca trail over the mountains and into the jungle that the idea germinated that we should write a guide for hikers. We wanted to share our new-found knowledge. This was a particularly hard-won route. We learned about it from a fellow gringo who had been told by a member of the Costa Rican National Orchestra that if he went to a big ‘Jesus Cross’ near La Paz and followed his left hand he would find a path down to the jungle town of Coroico. He hadn’t tried it and warned us that the Costa Rican had been drunk at the time. We found the statue of Jesus at La Cumbre and battled through a snow storm to the pass where the clouds lifted revealing a perfectly engineered trail leading downhill to the treeline. Two days later we were picking oranges in Coroico. Apart from the Inca Way, where we met a couple of other hikers, the paths we had discovered were used exclusively by the local farmers. When we walked past a settlement, women would sometimes scream, grab their children and flee inside their huts. We were not much troubled by the lack of topographical maps. The road map showed us roughly where to go, and our compass and directions from the locals did the rest. During a three-day river journey in Bolivia we wrote a description of the three treks and added a couple of day walks along with a few notes to help other travellers get around and sent it to my mother-in-law to be printed. ‘The Little Yellow Book’ was published in 1974 and cost US$1.95. So 2014 is not only the 40th anniversary of the founding of Bradt Travel Guides – from that stapled booklet we now have over 200 rather smarter-looking guides on our list, as well as a clutch of awards — but it’s the 50th anniversary of that muddled trip to the theatre. I knew there must be advantages to being absent minded! we just met at the Batán de Tayta in Chachapoyas a few days ago – and I just realized that about 20 years ago I followed your footsteps on the La Cumber to Coroico path, described in your little book…. Great! What a lovely article, makes me want to go immediately! Welcome to SWSA, sorry I didn’t get to talk to you yesterday. Wonderful reading your material again, and don’t I miss Peru?? Hi Hilary, – never read your blog before. Very interesting. Had no idea about Royal Hunt of the Sun. 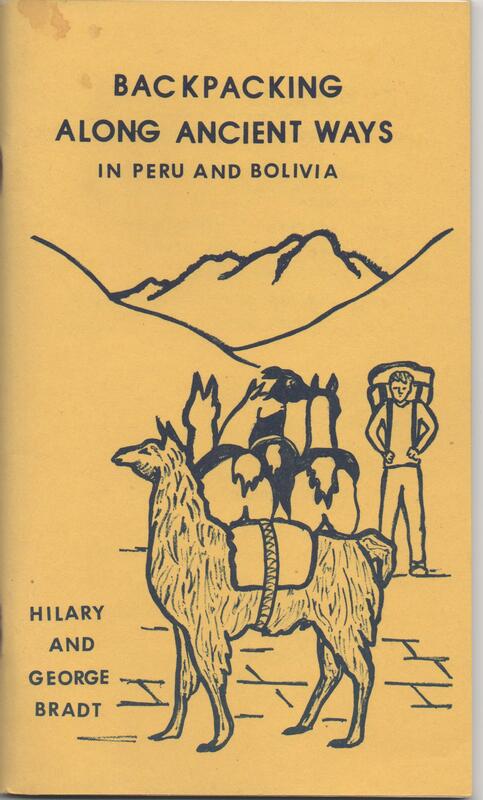 I wanted to thank you for sending me the latest edition of Backpacking in Peru & Bolivia. I thought those screens were a great way to identify the prose entries. I’ve just learned about a movie you must know about: Reaching for the Moon – it’s about Elizabeth Bishop and Brazil. I’m resorting to this method of contacting you because my computer crashed and took my email addresses to some far off place. Lovely article. Good to see the original brochure cover too!